How wonderful it is to be back in the states and in a land where all the signs are in English and I don’t have to rely on my limited French/Italian and public transportation to get me around. And how absolutely grateful I am to be typing this from my MacBook Pro, fully equipped with a USA standard QWERTY keyboard, no longer the European standard keyboard with foreign accents and different functions per keystroke. As you may have noticed, I didn’t blog my last day in Venice and my day in Milan. Well, I’m here to give you a quick summary of the flurry that was those last two days in Italy. The last day in Venice was spent walking (no water bus this time!) from our hotel across the city to Piazza San Marco. To our destination of Rialto Bridge, the oldest bridge to cross the Grand Canal in Venice, it was a brisk 45 minute walk. Along the way we stopped at several authentic Venetian mask stores, where my friend Anthony set his eyes on the mask of his dreams, with a whopping price tag of €180 Euros. 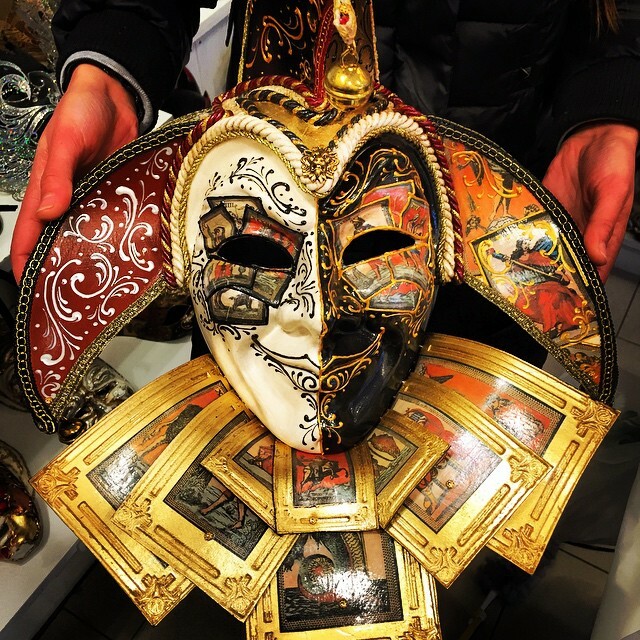 At one of the mask making shops, the friendly store owner and mask designer showed off his latest mask designs and preview for Carnevale with both me and my sister as his models. Once we reached Rialto Bridge, we stopped for photos and a casual chat with a store owner, where we learned that during Carnevale, it takes an average of forty minutes to cross the bridge, due to high traffic in numbers of pedestrians. 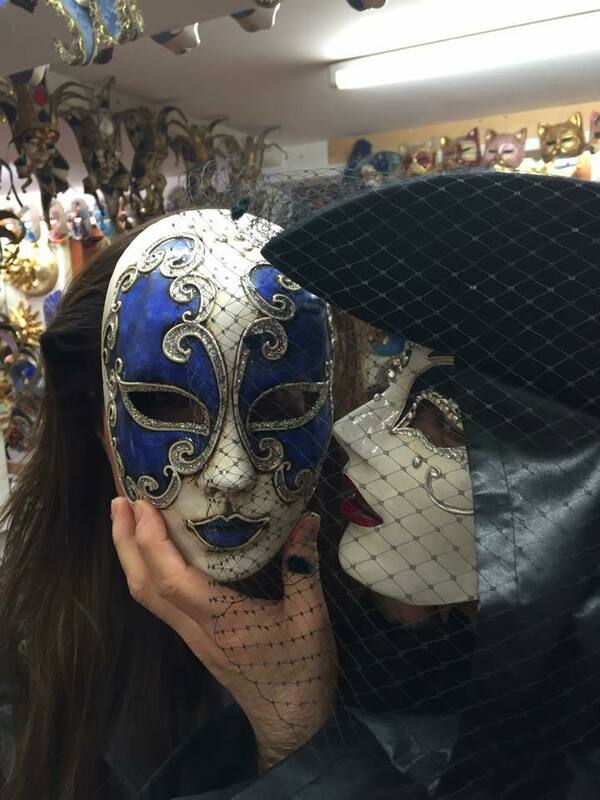 The €180, authentic, Venetian mask. Photo belongs to Adlizama (Source: Instagram). Who’s there behind that mask? The view from one side of the majestic Rialto Bridge. Being in Venice, one of the must do activities is going for a gondola ride around the canals. 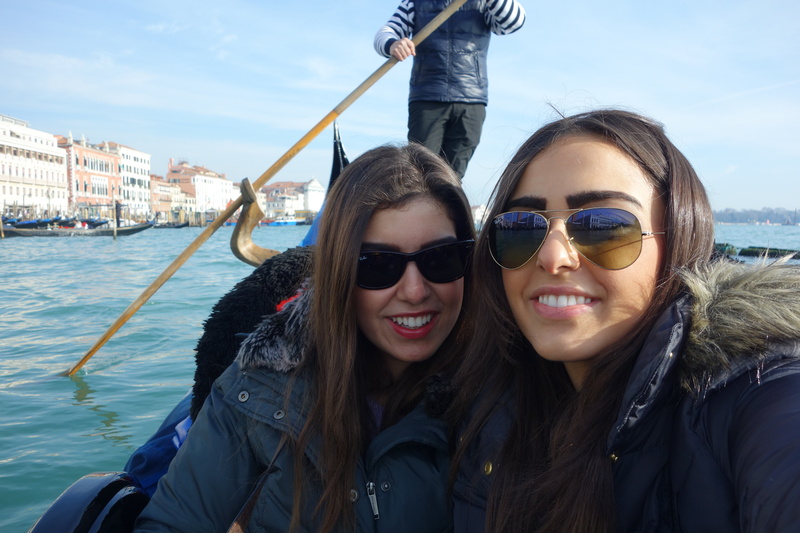 Though it was a bit chilly, it truly was such a genuine experience to be able to see how the locals get around in Venice. Though gondolas are now reserved for tourists, locals navigate the waters by water taxi, water bus, or their own private speedboat. Our gondola driver told us that his profession comes from a long line of tradition in his family. He said that his father was once a gondolier, and when it came his turn to learn, he had to go through five years of school to learn English, French, history, math, and science. Then he had to go through training, multiple exams, and finally a safety swimming test. He explained to us that should he or a passenger fall in the water, he is the lifeguard and will jump in after the passenger to save them. Fortunately for him, and for all passengers, he hasn’t had an experience like that yet. With many years of practice comes learned talent, so rock the boat as much as you want, the gondolier will not fall in the water! 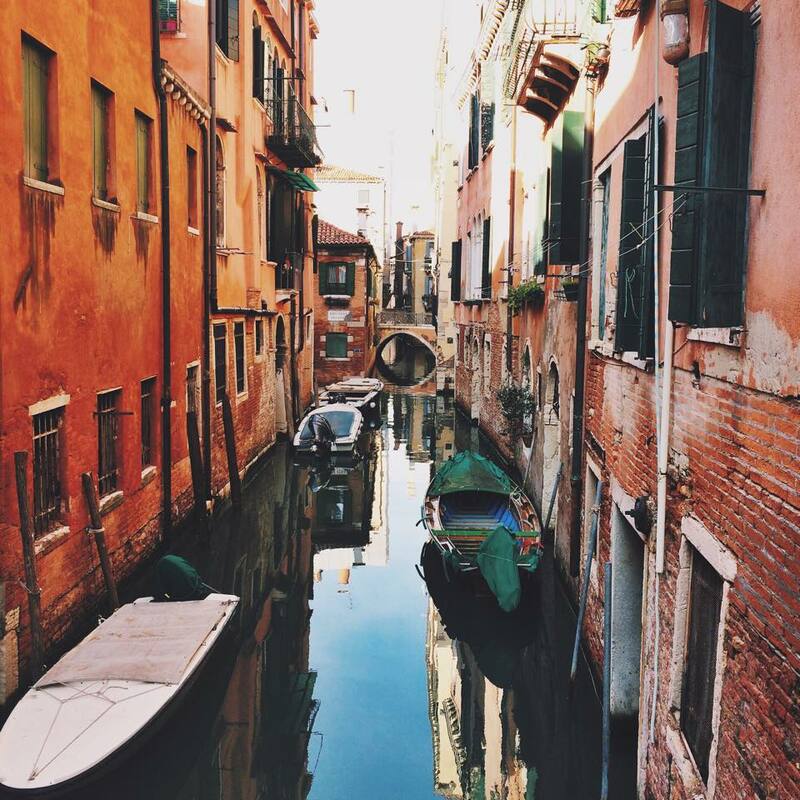 The breathtaking, perfectly sculpted, narrow waterways between apartments in Venice. Selfie on the gondola ride around Venice. Later that day we went to the beautiful island of Murano, the famous glass making island of Venice. We spent 5 hours on the island going from shop to shop, looking at the different trays, plates, cups, statues, chandeliers, and figurines handmade out of Murano glass. On the island, Anthony purchased a glass tray and I purchased a gold and turquoise glass pendant for my necklace, and we returned back to our hotel, then dinner. I enjoyed simple olive oil and garlic pasta while Anthony indulged in an entirely Venetian dinner. He started with a primi of Venetian style Sardines, followed by a secondi of cuttlefish cooked in it’s own ink, and finally a chocolate-rum mousse Venetian cake. To say he was feeling adventurous was a bit of an understatement! We all watched him and made jokes as he experienced the culture shock of a traditional Venetian meal. The next morning we spent in Milan. Though I only spent a few hours in the city, I managed to knock out a few very important, maybe touristy, things. First I saw the Duomo, followed by a walk through in a Van Gogh exhibit at the museum right next to the Duomo. Shortly after we went to Coppola’s for delicious Italian gelato. Right next door there happened to be a long line of fans waiting in line to meet a famous Italian singer. Though I can’t remember the name of the artist, it attracted many. Interestingly enough, we arrived in Milan on the last day of Milan Fashion Week, and coincidentally, the lead actor of The Fault in Our Stars, Ansel Elgort, was in front of the Duomo around the same time that I was. Unfortunately, I didn’t find this out until later that evening, so I missed the chance to meet him. Later, I went shopping around the Galeria and literally drooled at the beautiful clothes, admiring the European fashions of stores such as Mango, Zara, and Pull&Bear. For dinner that evening we went to a family owned, authentic Sicilian restaurant, which greatly reminded me of one included in the Godfather series. The next morning was my flight to Houston, aka time-to-spend-24-plus-hours-awake-and-uncomfortable-on-airplanes. My journey took all day, as I went through three plane changes in Milan, then Frankfurt, and finally in Newark. Now I’m sat in my living room, typing the conclusion of my Euro Trip blog posts, reflecting on the incredible past two weeks I spent abroad. In the near future I plan on recording my second video blog, detailing the lessons I learned while overseas. During this trip I learned and realized many things, and found a passion for learning and exploring even more. Be on the look out for my vlog, and I thank you for taking this journey with me and reading all that I have to say.